SEA GIRT, NJ USA -- POPULATION HEALTH UPDATE NEWS SERVICE -- APRIL 9, 2019: Asked by its C-suite to quantify contributions of its multidisciplinary care team for its highest-risk patients, AltaMed Health Services Corporation readily identified seven key performance metrics associated with the team. Having demonstrated the team's bottom line impact on specialty costs, emergency room visits, and HEDIS® measures, among other areas, the largest independent federally qualified community health center (FQHC) was granted additional staff to expand care management for its safety net population. 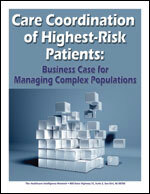 Care Coordination of Highest-Risk Patients: Business Case for Managing Complex Populations chronicles AltaMed's four-phase rollout of care coordination for dual eligibles -- a population with higher hospitalization and utilization and care costs twice those of any other population served by AltaMed. In this 25-page resource, Shameka Coles, Altamed's associate vice president of medical management, describes the initial four development phases and associated challenges, as well as the composition, roles and responsibilities of the multidisciplinary care team and its impact on these multi-faceted, highest-risk patients. HIN is the premier advisory service for executives seeking high-quality strategic information on the business of healthcare. For more information, contact the Healthcare Intelligence Network, PO Box 1442, Wall Township, NJ 07719-1442, (888) 446-3530, e-mail info@hin.com, or visit http://www.hin.com.